Singer/songwriter Greg Herriges and lead guitarist Rick Vittenson (a/k/a Athanor) met on the steps of the Highland Park, IL Recreation Center in the summer of 1965, just as The Beatles’ album “Help!” was released. Both avid rock mavens (with roots back to Buddy Holly, Elvis Presley, Roy Orbison, Dion and the Belmonts, and The Beach Boys), they formed a group called the 4-to-Go when Greg was a high school sophomore and Rick was a junior. The group broke up, as groups eventually do, and they each joined other bands. In 1973 Greg and Rick reunited. Greg had completed school out of state, while Rick had begun working with both the NME and Crawdaddy! Magazine. When Greg returned to Illinois for work as a teacher - his profession to this day, including teaching a course on the Beatles – he put together a home studio. After time spent away from performing he called on his old friend, and thus Athanor was born. Three mellow-heavy singles were issued in the early-to-mid ‘70s. Sitting inside the circle which occupies such early ‘70s/post-‘60s psych-pop/rock burnouts as Creme Soda and Drywater, Athanor is not pure underground esoterica, as they dose their damage with an ear bent towards P-O-P, which separates it from the sea of pretenders. In 2013 and 2014, two LPs of material from this period were released on the Guerssen Records label outta Spain, and both received rave reviews. Buoyed by the success of these two LPs, Greg and Rick spent three years recording an album of all new original songs for this, their Kool Kat Musik label debut – “Hills of the Universe”. For this project they invited seasoned rock instrumentalists to contribute - Chris Drehobl (former drummer of legendary Chicago band The Mauds), Quent Lang (former saxophone and flute player of The Mauds), Jeff Murphy (of Shoes), guitar virtuoso Harry Reinhart (Midnight, Traffic Jam and Skip Towne and The Greyhounds), John Belpedio (bass player for Almost Joe and Mid-Life Crisis), and Brian Cremins (of Pet Theories). Recording engineer John Towner helped them achieve the full sound they were looking for, and he even added synthesized strings on a few tracks. 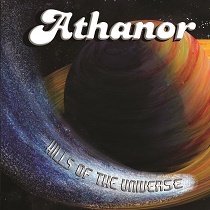 It has taken over four decades to realize this latest Athanor recording project, but they continue to play, and Greg is already writing the songs for the next album. “They are a perfect compliment for fans of other rare psych-pop bands like Lazy Smoke, Creme Soda, and The Only Ones.” – Powerpopaholic.com GREAT! !